No board game has as many take-offs as Monopoly. You’ve probably seen local Opolies for sale in tacky tourist stores while on vacation. There’s Londonopoly, Tokyopoly, New Deli-opoly, Cape Town-opoly, Hollywoodopoly and even Lubbockolopy (as in Lubbock, Texas). Among the multitudes of other Monopoly verstions are Photo-opoly, Christmas-opoly, Chocolate-opoly, Ice Cream-opoly, Wine-opoly, Earthopoly, Ocean-opoly, Farmopoly, Puppy-opoly and Beagle-opoly (though not, to our knowledge, Puppy-Beagle-opoly), Gardenopoly , Waffle-opoly, Princessopoly and Pirate-opoly, not to mention the counterculture Anti-Monopoly. 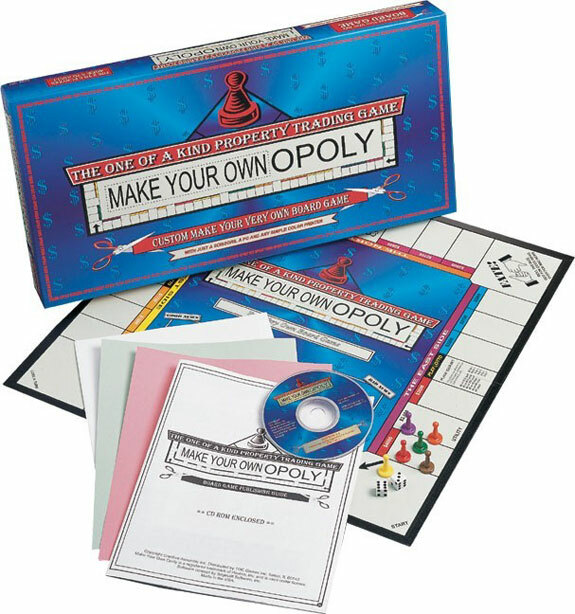 As the name suggests, Make Your Own-Opoly is a generic version of the original game with the theme and property names left for you to create. Concoct your own cards, bank notes and playing pieces. 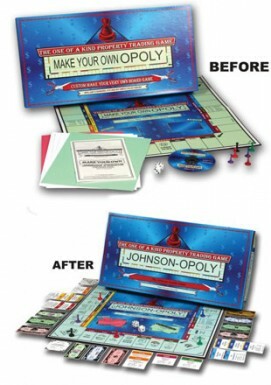 You are able to make your own Opoly by going old school, using pens, scissors and glue. But the cooler option is to go high tech. Make Your Own-Opoly comes with a CD ROM with all the software you’ll need to print out perfectly-sized property deeds and other game gear. Our favorite feature: you can crop photos to add to money, playing pieces and board decals. The high tech option does require you to have a computer that runs Widows (sadly, it won’t work on the Mac OS). You’ll also need reasonably high quality color printer and—most of all—you’ll need several hours (eg. 3 or 4) to complete all your game creation. The old school pen-and-paper method is a bit less time consuming, but not much. Once you complete your Opoly creation you’ll find yourself with a game that has several (and somewhat inexplicable) differences will the original, the most irritating of which is the board size: it has 32 spaces, not the “real” Monopoly’s 40. Monopoly veterans used to automatically moving pieces around the board without counting squares will find themselves frustrated. Other differences include the rules around Jail and the use of houses and hotels. Because of that, we prefer playing the original version of Monopoly to the Make Your Own incarnation. Still, can recommend Make Your Own-Oply, especially for younger kids, for families and for team-building exercises. The key is looking at it as less of a game and more of a project. With Make Your Own-Opoly, making the game is far more than half the fun. Best Video Game Trailer Ever? In my family we always called it Monotony.